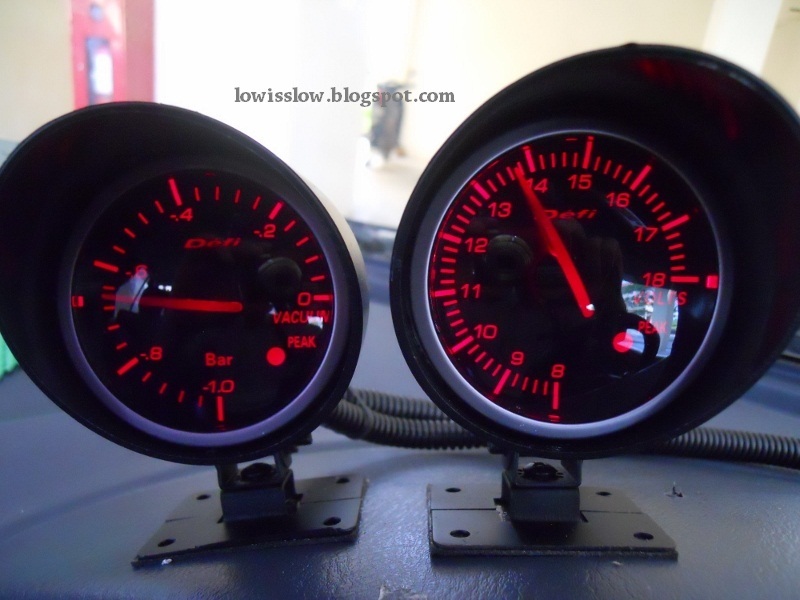 Vacuum gauge plays an important role to monitor the "health" of your engine. For the power supply, refer to the WATER TEMPERATURE GAUGE installations above. I just want to talk about the wiring of the vacuum sensor. As an older type of vacuum gauge, the vacuum hose connect directly to the rear of the gauge. But not for this type of gauge. It come with external vacuum sensor where the vacuum hose connect into it and the sensor send signal to the gauge. Ok, let’s start. There were two cables that belong to this sensor that when we combine it through the male-female connector, it will be one. 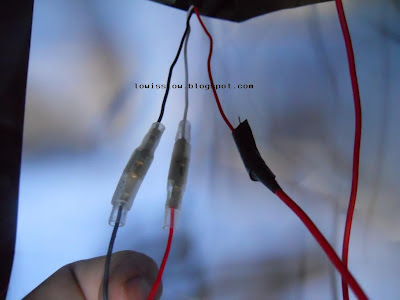 Sensor cable from the gauge will have two wires in it, that is RED and BLACK, and cable from sensor will have three wires that is WHITE, BLACK; connect it as picture 3 below or just follow the male-female coupling. Another wire from sensor is RED, connect it to key "ON" (refer to vacuum's wiring diagram). This is a power supply for the sensor. Another end of the pink colored socket (refer picture 2) connect to the vacuum sensor. Place the vacuum sensor away from heat and water. For vacuum source, you can find it somewhere near the throttle body or carburetor. It should be easily find as it will be black in color, as size as pencil. But not all of that hose can be use, find the most powerful sucking hose. Once you find it, cut it and connect it back by using T-joint as picture 4. Another point of the T-joint connects with the hose that come together with the gauge, to the vacuum sensor. Done!! Vacuum gauge reading for "healthy" engine should be between -0.57bar and -0.75bar during idle. My Perodua Kancil's reading is -0.62bar. If there is a project to install this gauges, I will write it here ok.. thanks for your support. For Oil Temp and oil press, you have to buy an Oil Filter Adapter (google for it) where the sensors will be mounted on it (adapter). Thanks but edit picture refer again please. It not have picture number below picture. I read and confuse in some paragraph thank you. 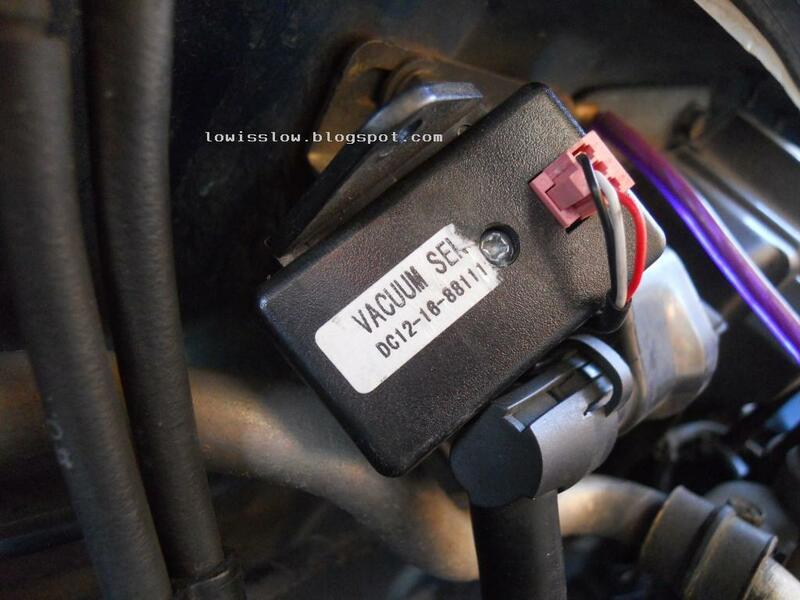 Why must cut wire from sensor RED to key ON because I think it have power supply for sensor from wire connect middle socket vacuum gauge to vacuum sensor socket ? and What key “on” ? where and how ? explain please . Oops.. I did it again. Very sorry for the inconvenience.. thanks bro. There is no power supply for vacuum sensor from middle socket of the gauge as there only two wire from gauge sensor's socket that is RED and BLACK; BLACK wire for grounding and RED wire for signal from sensor to gauge, NOT for sensor's power supply. Take note also only two wire can be attached to the sensor's socket(middle socket) of the gauge. refer picture 4 of part 1; Volt. Refer back to the vacuum's wiring diagram above. 2 wire from the rear of the gauge, and 3 wire from sensor. Another one wire (RED) from sensor must be connected to "KEY ON". Otherwise the gauge will not work and I never cut any wire on this. WHAT? Key "ON" refer to ignition key. We we know, the ignition turning sequence should be OFF, ACC, ON and START. As we turn the key to "ACC" position, the accessories such as CD player and clock will be turn on. When we turn the key to "ON" position (KEY ON", the warning indicator (on the speedometer), power window, blower,turning light and wiper can be operated. WHERE? you can find this wire from/to the ignition switch, just above you right knees when you drive. HOW? you need test lamp to find this wire. One side of the test lamp wire to vehicle's body(-ve), and another one attached to the suspected "KEY ON" wire. Make sure the test lamp lights ON ONLY when you turn the key to "ON", and turn off when you turn the key to "ACC" and "OFF" position. That is "KEY ON" wire. Typing Error!! refer to last paragraph above.. It should be like this : "Make sure the test lamp lights ON Only when you turn the key to "ON", and turn off when you turn the key to "OFF" position. That is "KEY ON" wire"
bro, i try to connect and is all follow the step, but the meter show 0 when it is idle and it don move when i press the gas, and the meter is hot. Is it any problem? Did the lights come out? If yes, meant that no problem with your gauge power's wiring. But check back sensor wiring. one of the 3 wires need to be connected with Key ON/ACC.. Check also where you connect the vacuum hose. make sure the vacuum hose where you connect the sensor got suction also.. If the gauge little bit warm, it is normal for most electronic devices. But if the gauge is hot until you cant touch it, something wrong with that gauge/wiring. Remove it ASAP.. Yes, you can tap it there (fuse box) as long as you can identify which one is KEY ON, LIGHT, and ACC wire by using Test Light. But i am sorry that i cant show you the diagram. 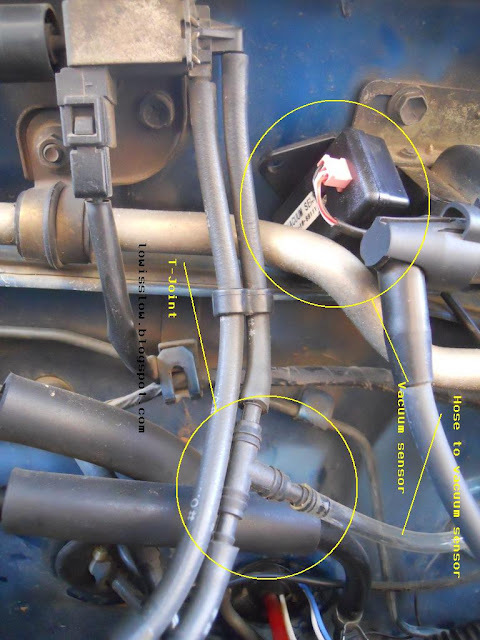 For the vacuum hose, just find the black small hose (as big as pen) that connected to the throttle body. while engine on, try to remove it from the throttle body and it should be sucking and at the same time the engine rpm will be slightly low. Hope this can help you..
How to identify the most sucking hose on my viva. fiz a instalação do relógio vacuo e defi e percebi que o mesmo simplesmente nao funciona, ele fica marcando apenas 0 e as vezes fica oscilando (tremendo) o que posso ter feito de errado, pode me ajudar? pra que serve o botão SET atraz do relógio? I did the installation of vacuum and defi clock and realized that it simply does not work, it is scoring just 0 and sometimes sits oscillating (shaking) what can I have done wrong, can you help me? to serving the atraz SET button clock? So now u get it connected? what the function of yellow wire? on the diagram said that it must attached to the headlight switch, where i can find the head light switch and what the function of the yellow wire? if i not connected to the headlight switch, it will way damage to the device? please reply, urgent. When it has been caught into a tight spot and is not capable of getting away, the unit halts and hums a sound to assist its owner locate it. Boleh x tuan tunjuk kan hose vacuum untuk saga flx. Bacaan meter vacuum saya -0.4.adakah saya silap sambung hose vacuum.dan tekan sikit je pedal minyak meter selalu naik peak. The water lift of a vacuum cleaner is another useful indicator of performance in that it is a means of comparing the suction of one motor to another and, generally speaking, the more water lift the better. Hi , do anyone know how to connect the defi vacuum C2 .. for myvi lagi best .. thankyou in advance . ASAP .. I just getting confused looking these comment here that said vacuum does not have power supply .. how to power up then ?